Pandora's an average teen, glued to her cell phone and laptop, until the day her long-lost father sends her a link to a mysterious site featuring photos of her as a child. Curious, Pandora enters the site, unwittingly unleashing a global computer virus that plunges the whole world into panic: suddenly, there's no Internet. No cell phones. No traffic lights, hospitals or law enforcement. Only Pandora's Box, a virtual-reality game created by Pandora's father, remains up and running. Together with her neighbors, gorgeous stepbrothers Eli and Theo, Pandora must follow the photographs from her childhood in an attempt to beat the game and track down her father—and rescue the world. Part The Matrix, part retelling of the Pandora myth, Doomed has something for gaming fans, dystopian fans, and romance fans alike. TRACY DEEBS is also the author of the Tempest series and the co-author of The International Kissing Club (under the pseudoynm Ivy Adams). She lives in Austin, Texas, where she is a writing and literature professor at Austin Community College. 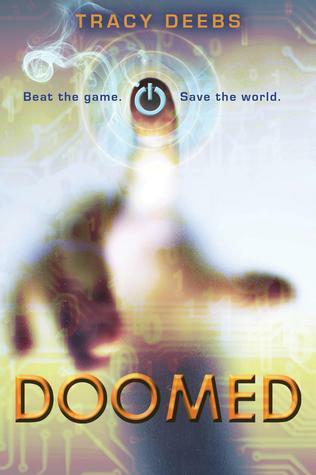 The action in Doomed was great and I loved the characters. They were very well developed and I liked that they grew stronger as the story progressed. But the plot of the story seemed really unrealistic to me. Overall this is a story with good action and well developed characters, but if you are looking for a really solid plot I would skip this one.